"TLCIG creates boldly cut, yet delightfully subtle, gems of spontaneous musical composition." musical and geographic backgrounds to form a unit of unprecedented talent. in and outside of academia), and many years of performance experience. as an unfailing support for its cohesive expressiveness. A venerable figure on the Bay Area improv scene, Ron has been performing and various groups and configurations of artists for over 20 years. JEFF HOBBS - violin, cornet, sax, flutes, clarinets, etc. the Emergency String Quartet, The Emergency Piano Quintet and 'The Che Guevara Memorial Marching (And Stationary) Accordion Band' which has recently issued a CD on Public Eyesore no. 85. Bob has worked with improvisers from all over the U.S. and abroad, including: Toshi Makihara, Scott Rosenberg, John Shiurba, Blaise Siwula, Jack Wright, Bhob Rainey, Michael Zerang, and Jeb Bishop. plays metaPiano and electronics. (ZeroEggzie Recordings 0x003, 2000). He also has a duo CD out with Carol Genetti voice, and himself on cello, "The Garden of Earthy Delights" (Spring Garden Music 004, 2000), as well as a CIMP recording (Creative Improvised Music Projects Vol. 96, 2000) with Jack Wright and Bhob Rainey on saxophone; He and Fred Lonberg-Holm on cello. 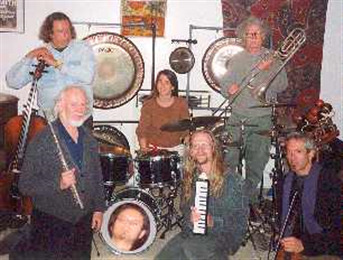 in performances with Leo Smith, Eddie Gale, Matt Ingalls y2K, Tom Nunn, and with the Oakland Electro/Acoustic Sextet at the Big Sur Experimental Music Festival in May 2000. Scott has been active in presenting and promoting creative music in the Bay Area. His recordings include: scott r. looney - solo piano - #meta-cd001 -- and recursive heretics - #meta-cd010 with aaron bennett - soprano sax, scott r. looney - live sampling, processing A.L.L.- #meta-cd002. Nearing his mid-30's and living in Paris, France, Jim picked up the flute and shortly thereafter acquired a c-melody sax. In the early 70's he participated in a year-long workshop organized and led by Steve Lacy. Jim put together the "Free Music Formation" about this time, and played in Paris and other European cities. He returned to the States in 1975 and settled in Washington, D.C. where he formed "The Art Performance Group" in 1979. This was a multi-media group which included poetry, dance, art-projection, and sometimes a light show. Jim is also a poet and often includes spoken word in his concerts. he launched his own group "Forward Energy" which has been performing regularly since that time. Jim has also participated in Marco Eneidi's large ensembles. and trumpeter Eddie Gale's "Orchestra for World Peace." In the Spring of 2000, he founded the Electro/Acoustic Sextet of Oakland which was a melding of free jazz and 'avant' academic styles. The group performed in Oakland and at the Big Sur Experimental Music Festival in May, 2000. In the Spring of 2000 he performed in the 501 Festival at Theatre Artaud in composer Matthew Burtner's piece for nine tenor saxophones, "Portals of Distorion." "Gongwoman" is an east bay percussionist, teacher of music technology, recording engineer, and reviewer of electronic music equipment for Electronic Musician and other magazines.